Despite well publicized excitement about downtown revitalization, young adults are fueling rapid growth in suburban areas like Bartram Park across the country. Is it by choice, or necessity? According to recent research, millennials appear to be the driving force behind a resurgence in suburban growth nationwide. While a handful of places like Seattle, Chicago and Charlotte have become denser since 2016, many like Dallas, Orlando, Austin and Jacksonville are among a growing number of metropolitan areas that have become less dense since the 2010 census. In Jacksonville, the metropolitan area density is estimated to have declined -3.1 percent between 2010 and 2016. With a limited supply of walkable neighborhoods, real estate prices skyrocking and housing availability being scare in desired urban core areas like San Marco and Riverside, suburban areas are witnessing significant booms of their very own. Dubbed the “Southern Gateway” to Jacksonville and despite being 18 miles from the city’s urban core, Bartram Park is one of North Florida’s fastest growing communities that also appears to be attracting millennials and young families. According to the 2015 US Census estimates, 40% of the population residing in the neighborhood’s zip code falls between the ages of 20 and 44. This number is slightly up from the 38% identified in the 2010 census. Named after the United State’s first native-born naturalist, William Bartram, plans for Bartram Park date back to 1999, when the Eastland Company announced its intentions for a massive 4,700-acre massive mixed-use community to take advantage of the city’s rapid southward growth pattern. Largely developed over the last decade, Bartram Park also includes design features that attempt to incorporate certain elements and urban sensibilities to attract millennials. Despite being nearly 5,000 acres in size, nearly half of the property is set aside for the Julington-Durbin Preserve, offering residents direct access to hiking, sightseeing, horseback riding and biking. 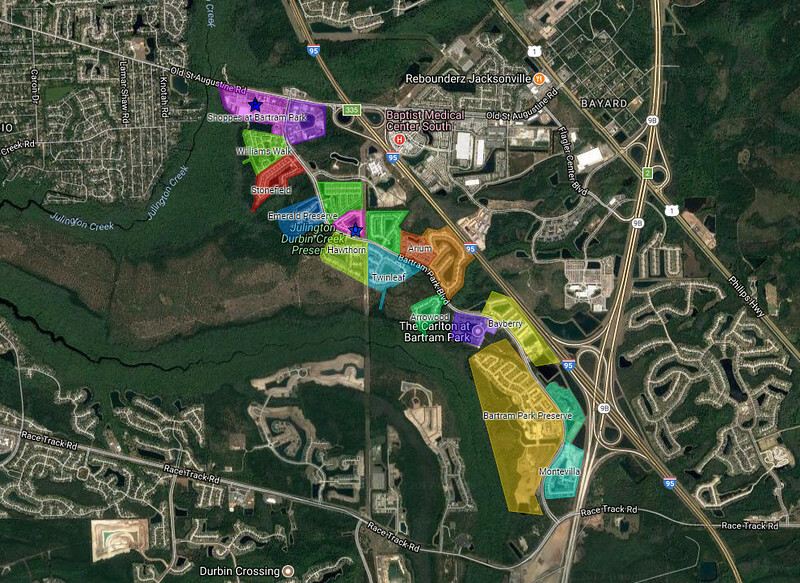 The remaining 2,600 acres is packed with 9,700 residential units, 1.3 million square feet of commercial space, 1.7 million square feet of office space and 300 hotel units, making it an anomaly for suburban Jacksonville. Within a stone’s throw of Baptist South medical center and Flagler Commerce Park, it’s marketed as a location where residents have the ability to work and shop with minimal commuting. In addition, unlike the pedestrian hostile highways of the late 20th century, the development’s primary street includes a parallel multi-use path tying all of its individual districts together, encouraging physical activity for its residents in the process. While Bartram Park does not feature a “town center”, commercial owners also appear to be attempting to adapt their properties to changing consumer preferences in order to keep their investments relevant and viable. Examples include the conversion of existing strip mall common areas and sidewalks into outdoor dining areas and sidewalk cafes. 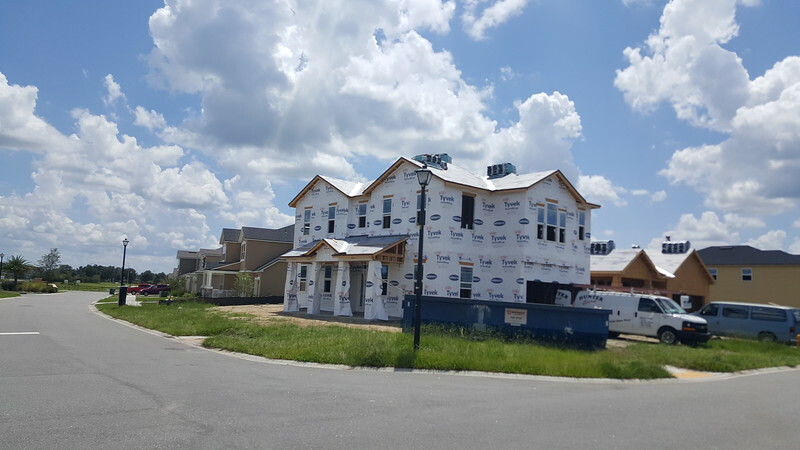 Nevertheless, the ultimate answer to Bartram Park’s appeal boils down to good public schools and the availability of a diverse range of affordable new construction housing options. 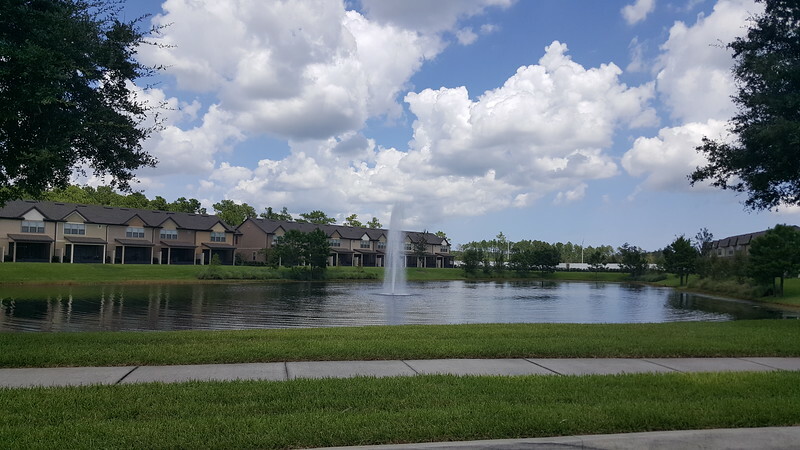 When it’s all said and done, these remain quality-of-life amenities and assets that are easy to find in suburban areas and in limited supply in the core areas of cities like Jacksonville across the country. Here is a photographic tour of Bartram Park.